NEW YORK—In what has become the foremost annual conference of baseball-glove-wearing theory, major-league players past and present once again gathered at the Jacob K. Javits Convention Center in Manhattan this week to discuss the advantages and disadvantages of wearing their index fingers on the outside of their baseball mitts. Now in its 47th year, the weeklong convention is intended to explore some of the unanswered questions surrounding forefinger baseball glove placement, such as whether wearing one's index finger on the outside of the mitt can increase pocket-depth and reduce sting; whether forefinger placement is a case of personal preference and, if so, what genetically predisposes an individual to choose an inner or outer placement path; and whether people just wear their index finger on the outside of their gloves because they saw their favorite baseball player do so. "We don't pretend to think that a player will leave this convention with a full understanding of why he puts his index finger where he does in his mitt," said MLB commissioner Bud Selig, adding that all 1,200 active major-leaguers are expected to attend. "All we can do is offer a forum in which to thoughtfully discuss the question with the rigor and curiosity it deserves. Every year we try to challenge our players with new ideas." 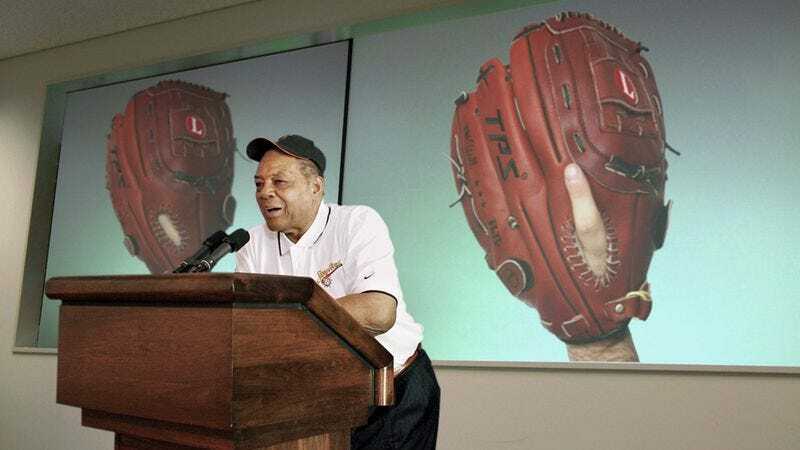 "For example, Willie Mays will hold a daylong symposium debunking the theory that wearing one's index finger on the outside of the mitt allows a player to close the glove more quickly around the ball," Selig added. "Sign-ups for his lecture completely filled up before this year's All-Star break." According to event organizers, each Index Finger Convention opens with Yankees Hall of Famer Yogi Berra asking the Key Question, that being: "Baseball mitts were designed with five finger slots, and at some point some players decided to no longer use the section created to encase the forefinger. Why?" With that in mind, sources said, players use the meeting to explore those facets of forefinger placement that have vexed or intrigued them the most, not only during the previous baseball season, but throughout their entire careers. "I'm definitely going to go to the personal testimonial lectures," Philadelphia Phillies first baseman Ryan Howard said. "[Yankees first baseman] Mark Teixeira is a first-time presenter who switched to putting his index finger on the outside of his glove this year. I want to see how it worked for him, because I'm thinking of doing the same. I think it helps first basemen more so than outfielders. I heard that somewhere." "I'm looking forward to spending most of the conference just talking to other players about why they put their index finger where they put it," New York Mets outfielder Jason Bay said. "I keep mine on the inside of my mitt, but I enjoy hearing why others don't." This year's program features convention mainstays, such as the Cal Ripken, Jr.–moderated panel "Increased Injuries? The Biggest Myth About Wearing Your Index Finger On The Outside Of Your Glove." In addition, many players have visited the Rawlings-sponsored history exhibit, which explains that, because outside index finger placement became so popular in the 1980s, the company began making gloves with an actual forefinger aperture. On Saturday at 10 a.m. and 4 p.m., Mike Schmidt will present his seminar, a perennial favorite, devoted to the 1982 season, during which he wore his index finger in the inside of his mitt for the first half of the year and on the outside for the second half. One of the convention's unexpected highlights occurred on Tuesday when Alex Gordon of the Kansas City Royals presented his lecture "My Index Finger And Baseball Gloves: A Personal History." Gordon's frank, often confessional presentation detailed how he wore his forefinger on the inside of his mitt throughout Little League, and then for reasons he was never able to understand—"Maybe just to be cool and fit in," Gordon openly admits—he gradually moved the finger to the outside of the glove during high school. "Now it just feels weird to put my index finger on the inside of my mitt," Gordon told an audience that included Derek Jeter, Albert Pujols, and 2010 MVP Joey Votto, all of whom could be seen nodding in agreement. "But truthfully, I bet if I wore my index finger on the inside of my mitt for over 10 years, and one day put it on the outside, it would probably feel just as weird. In the end, I guess I don't know why I started putting my index finger on the outside of my glove." "But then again, that's why I'm here," he continued. "That's why we're all here."